Well, we woke up to snow on the ground. Gotta love Colorado. The weather can change a lot over night. My card today is based on the Paper Craft Crew Challenge #185. I love the sketch. The card came together so quickly. Last week my husbands brothers flew in to say goodbye to their mother. But while they were here they tackled a couple of projects we had going and helped us a lot. So I need a couple of Thank You cards. 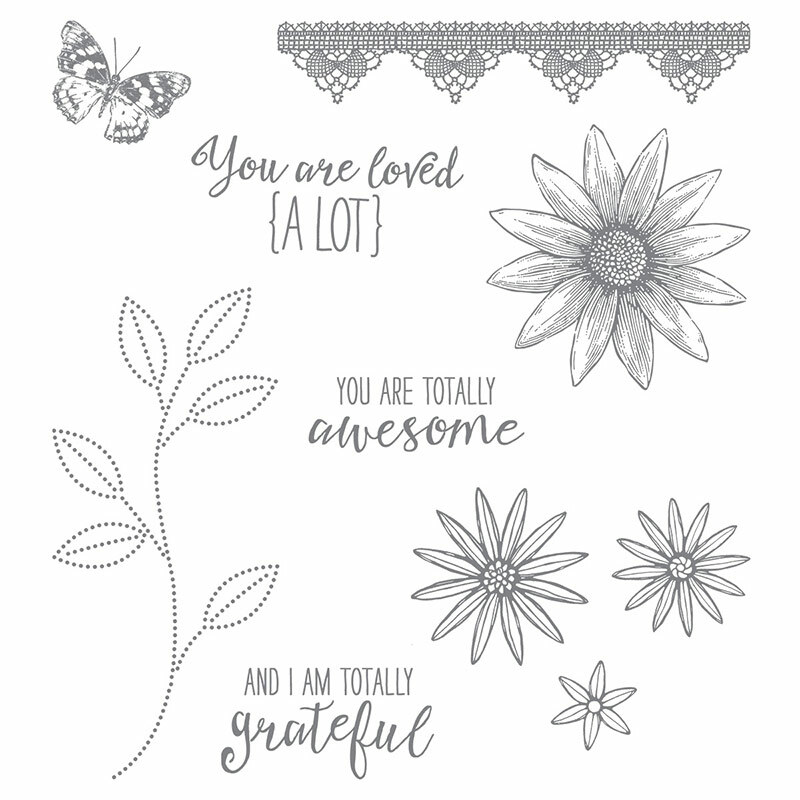 I used my Grateful Bunch stamp set to create this card. I really love the versatility it gives me. I've used it a couple of times already. OK, I just love flowers. I stamped the Daisy, Butterfly and sentiment in Soft Suede. Then I stamped them again in VersaMark and embossed them in Clear Powder. I cut my sentiment focal point with my Lots Of Labels Die(third smallest die). I cut one in Whisper White and one in Crumb Cake. I also sponged the edges of both pieces with Soft Suede to make them stand out a little more. Using my Aqua Painter I painted the Daisy with Hello Honey (This color maybe going away in April). 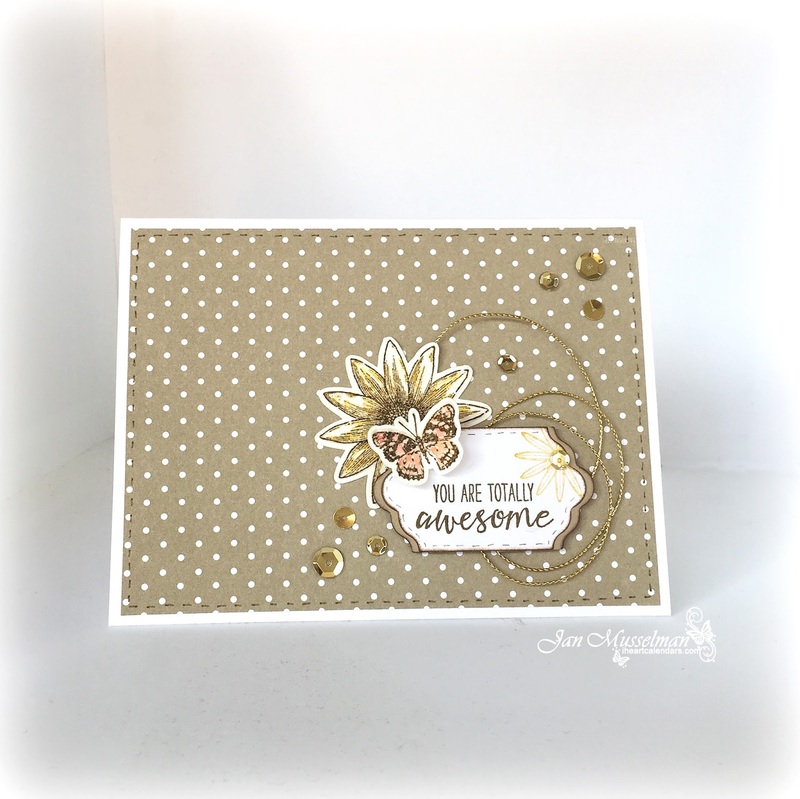 I also stamped the little Aster in Hello Honey too. I painted the butterfly with Watermelon Wonder (also part of in-color group that may retire). I faux stitched the Card Mat with Early Espresso. Don't forget the Sale-A-Bration is almost over. You have until March 31st to receive free product with a $50.00 purchase (before tax & shipping). For every $50.00 purchase you can pick one item from the Sale-A-Bration Catalog (The last 2 pages have items that are no longer available). Sale-A-Oration 2nd Release Flyer. Just click on the word links above to see what you can get Free, if you order from me. 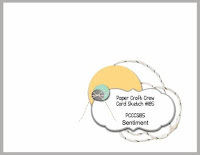 Paper - Whisper White- 100730, Crumb Cake-120953, Watercolor Paper-122959 and Subtle Designer Series Paper Stack-138437. Ink - Hello Honey-133643, Soft Suede-126978, VersaMark-102283 and Watermelon Wonder-138323. Marker - Early Espresso-131264 or 131261. Embellishments - Gold Sequins-132983 and Gold Cord (retired, you can substitute with Gold Metallic Thread-138401). Well, we have had and still are having a rough time around here. We moved back to California 8.5 years ago to help care for my mother in law who has Alzheimer's Disease. She has been living with us since she reached the moderate stage, 3.5 years now. We started Hospice care in our home 2 weeks ago. This is so hard on my husband. So I am just here for him. 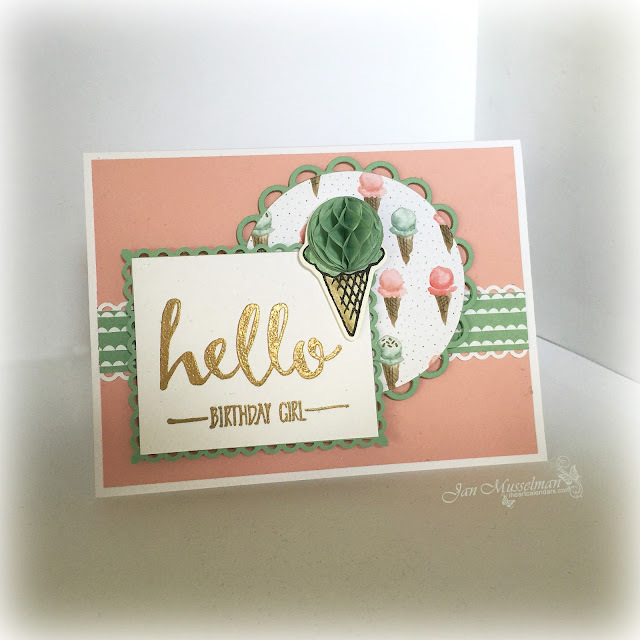 I did manage to put a card together earlier this week for the Mojo Monday Challenge #438. I'm barely getting it posted in time. I turned the sketch to make it horizontal. Hope you like it. Time is running out on the Sale-a-Bration sale. Offer ends 3/31/2016. Purchase $50.00 in product (before tax & shipping) and receive 1 FREE item from the Sale-A-Bration catalog.